These are sets I bought with the Fairground Mixer. One was a freebie (the Toy Workshop) when spending over $100 online, so thanks LEGO! Due to such small sets, the reviews are pretty tiny. This little set comes with 2 elf minifigures (male and female), and this is my first look at the elf – I’m impressed! 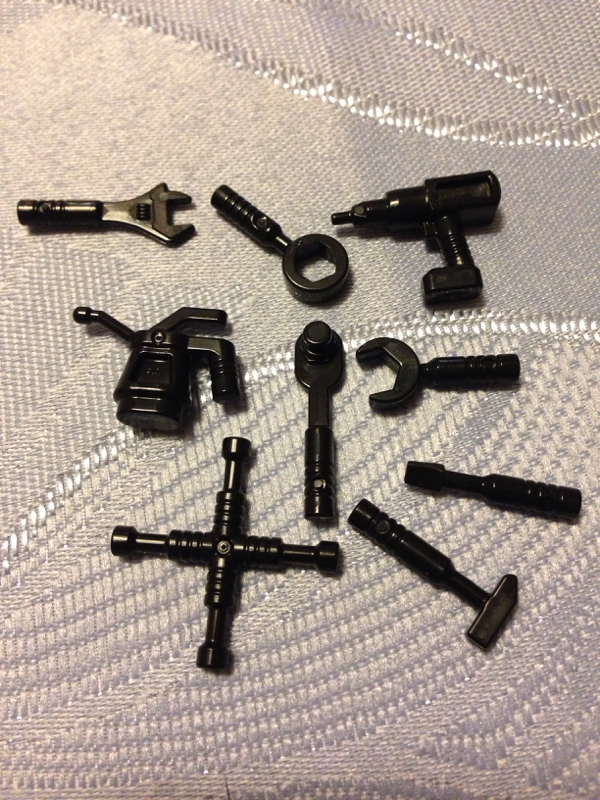 The female minifig has a reversible face, with a smile and a worried/scared on either side of the head, but my favourite aspect of this set is the set of tools. There is a drill, oil can, wheel brace, socket wrench, three spanners, hammer, and a screwdriver. Other notable pieces include some nice nougat coloured parts (a 6×8 plate included), a paint brush, and a 2x2x2 box in brown. The build itself is very simple, but LEGO has once again been very clever. 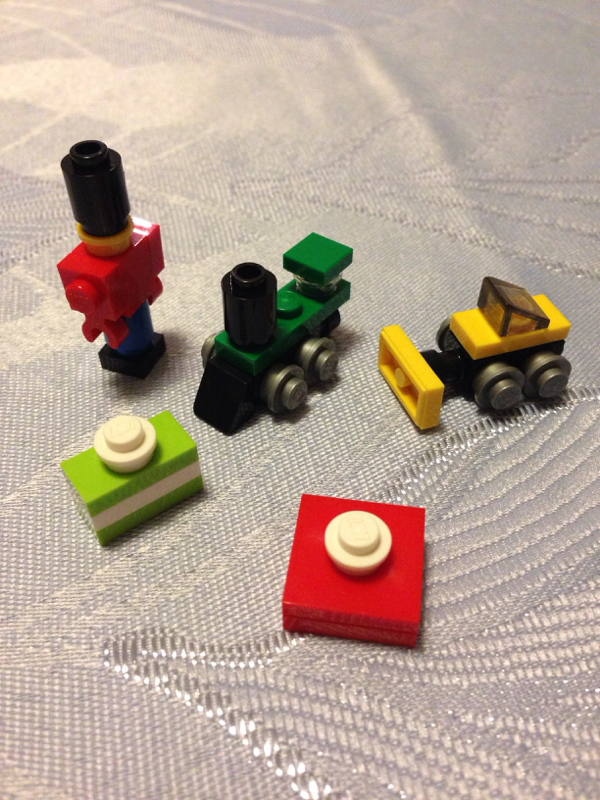 There are 2 presents and 3 toys that the elves appear to be building – a nutcracker soldier, a train and a bulldozer, and while they are tiny, they look really effective! I especially like the vise they have created. It looks brilliant. The rest of the build is pretty nice – the shelves for the tools are simple, and there are some little paint tins or pots on the desk as well. I like the fact that the roof is on a hinge, so it’s easier to get at the tools on the wall. The presents look good, but it’s a little cramped in there. The elves appear to have a bit of a struggle using the space! 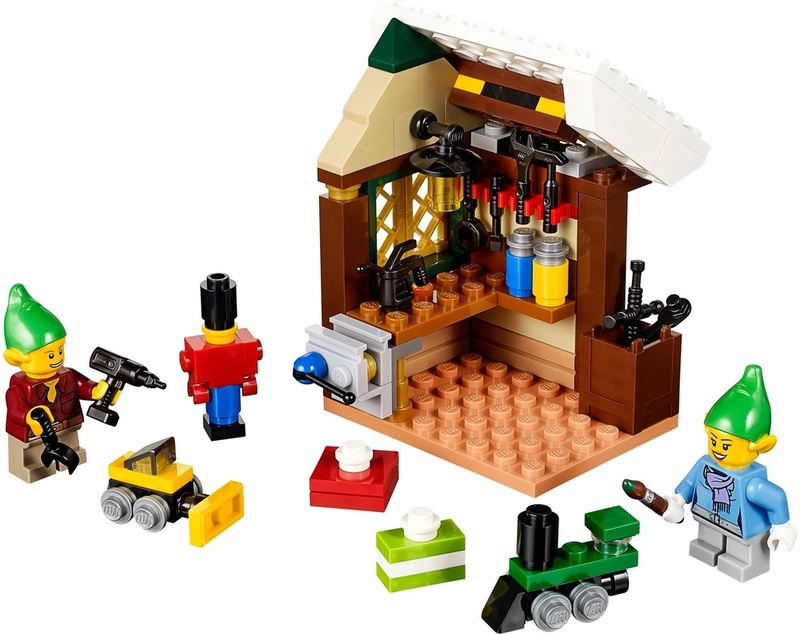 Admittedly, this set is supposed to go with the Creator Santa’s Workshop (10245), but I didn’t get that one. It matches quite nicely though. Like I said before, it’s a pretty simple set, but looks quite good. 8 out of 10 elves! Out of the box, this one comes with a tiny instruction page, a bag of parts, a white stand, and a cardboard arch. There are a couple of nice little printed parts, including a lock on a flat 1×1 tile, and an upright coffin. 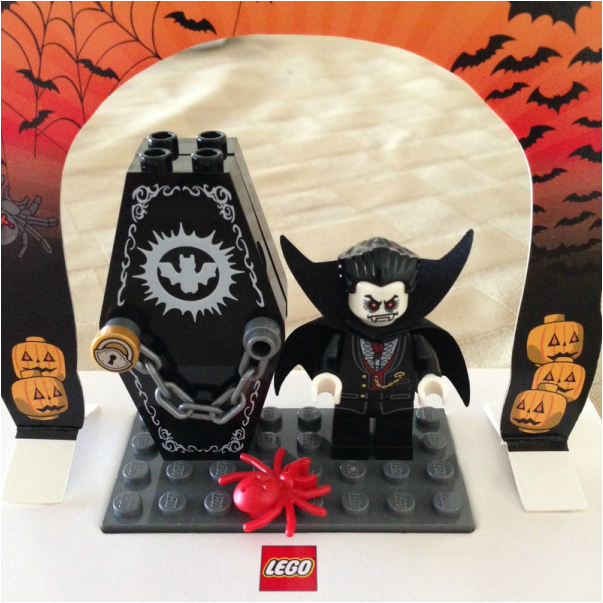 The minifigure is the Lord Vampyre, and is a pretty cool looking one! This is the reason I bought this set. There’s also a little spider. A very simple build, but there is a bit I’m dissapointed in – the cardboard arch. It just looks a little basic and cheap, so I didn’t even bother sticking it on. The other issue is inside the white stand. There is a 3M double-sided tape patch, which allows you to fasten the 4×8 plate down. Again, I didn’t want to waste the plate, so I didn’t worry about the white stand. You can’t expect much from a simple set like this, but there are a few minor issues with it. 6 out of 10 red spiders. Next on the Monday review list is 60059: Logging Truck!